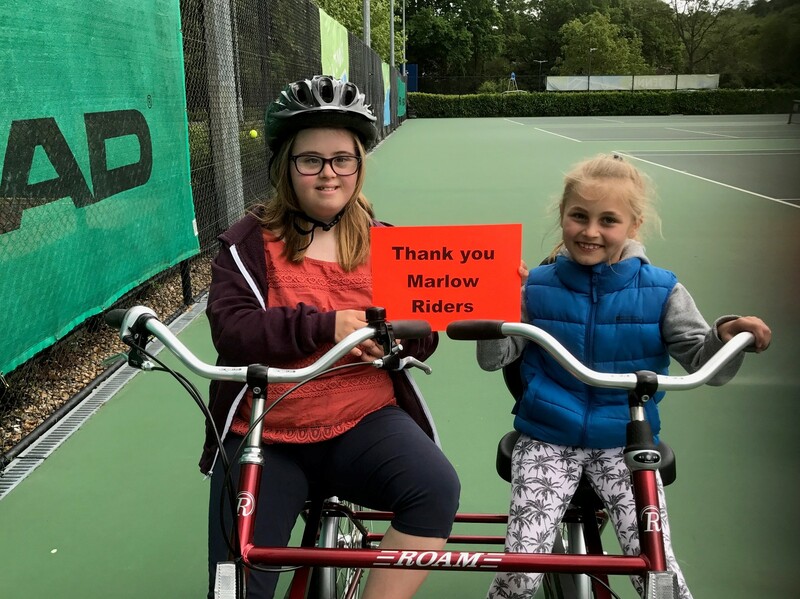 Thanks to the support and very generous donations from the Red Kite Ride and Marlow Riders Marlow Wheels for All has been able to develop its inclusive cycling project. 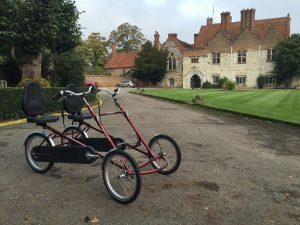 Marlow Wheels for All is part of the National Inclusive Cycling network run by the charity, Cycling Projects and provides weekly cycling sessions enabling disabled children & adults and those with poor health, to take up cycling and to help them make cycling part of their lives. 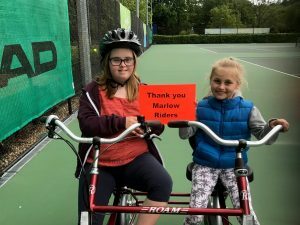 The funding from Marlow Riders will really make a big difference and it’s great to see a community cycling club that goes out of its way to support projects like ours. The parents and the volunteers who help run the weekly sessions will be thrilled with the news. We have used previous donations [from Marlow Riders] to help buy various specially adapted cycles such as the side by side tandem that has become very popular and can often be seen out on the paths around Bisham Abbey every Saturday. In the past two years, membership of the weekly cycling club has grown to almost 70 registered members. We have a great fleet of cycles, but support like this is going to enable us to invest in further specialist equipment and to look at ways we can help train local volunteers to enable us to run a range of different sessions such as group tandem rides and off-road cycling sessions for some of the more confident riders. Parents love the fact that we can offer families the opportunity to have fun on wheels! “I wanted to say a really big thank you to you and all your team for all your efforts over the last few months; and particularly for getting Elliot on 2 wheels – it was an absolutely magical moment for the whole family, and something we never thought we would see. Clearly Elliot has benefited from the confidence and self-esteem it has given him, as well as the sense of freedom, independence from other and his own control over his immediate environment. He really looks forward to the sessions and I’m sure he gets a great sense of accomplishment, as well as a very good physical workout. You’ll have seen how much he enjoys it – he doesn’t stop cycling from the moment we get there until we have to leave. He also has a great big grin on his face all the time. It is also a real benefit to Cameron and Alexandra to see their brother achieving something that they can both do; and no doubt it draws them both closer to Elliot, helping to reinforce that essential sibling bond that Elliot will be so reliant on in later life. There are so few activities that a whole family with children of such varying ages can enjoy together – and even fewer activities where one of the children is severely limited in so many ways by their disability. Even simple activities which most families take for granted, like a walk in the park, or going to the cinema, are significantly impacted by Elliot, his abilities, concentration levels and cognitive abilities. Now, our weekly cycling sessions are one of our few chances as a family to experience something together, where we are all on an equal footing. Thank you so much for giving us that gift – it really means a lot to us. Melanie and I have also benefited immensely, by being given the glimmer of hope that Elliot may be able to one day lead a more independent life, if he can at least cycle. Granted we need to work on other things like road awareness, directions, locking a bike etc., but there is now at least a reason to try and tackle these next stages of his development, if he can at least now cycle by himself on two wheels. He is already learning to cycle one-handed, without wobbling, so that’s a great step towards being able to signal!